Operators and pilots of big ships are again being asked to slow down in the Haro Strait, between Washington state and British Columbia. 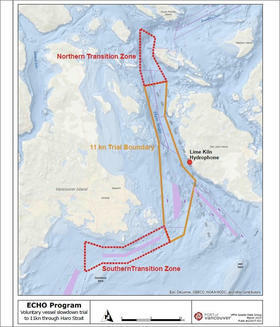 The voluntary vessel slowdown zone covers the length of Haro Strait, a busy shipping channel separating Victoria and Washington's San Juan Islands. The strait is also a vital summer feeding area for endangered orcas. 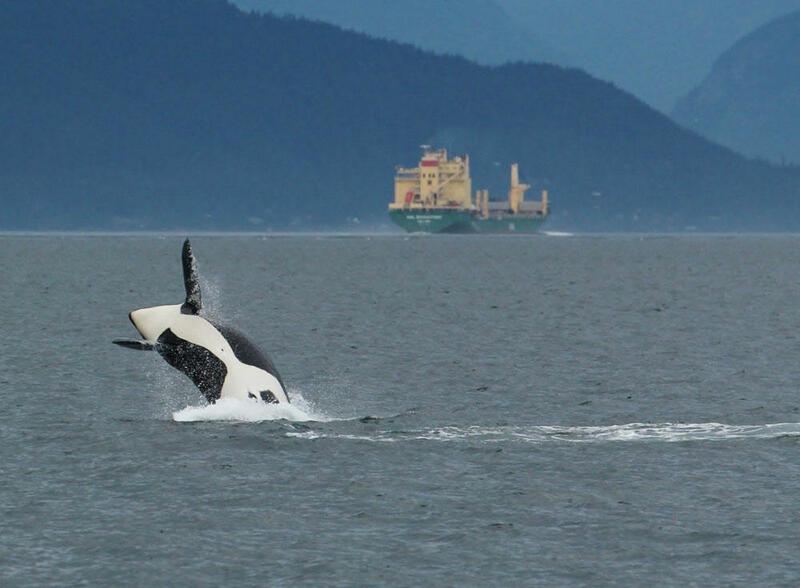 The Port of Vancouver, Canada, is leading the charge to reduce the impacts of vessel noise on the killer whales. A two-month trial slowdown last summer and fall demonstrated how cutting ship speeds to 11 knots could significantly reduce the racket underwater. Noise interferes with whale feeding success. Beginning next month through September, the port authority is again asking cargo ships, tankers, cruise ships and ferries to slow down, but this time only when whales are confirmed in the area. That should result in fewer vessel delays. "These speeds are estimated to result in delays of 11 to 18 minutes," the port's ECHO environmental program said in a newsletter Thursday. "We hope that this smaller delay will improve participation from all vessel types and in particular, bulkers and tankers." Scientists will again correlate vessel speeds on the surface with decibel readings from a network of hydrophones on the seafloor along with human observations of whale behavior. 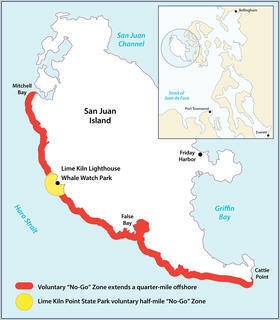 Separately, the Washington Fish and Wildlife Department has established a voluntary "no-go" zone for boats of all kinds in a one-qaurter to one-half mile wide strip along the west shore of San Juan Island to reduce disturbance to orcas at that prime feeding and lounging area. The population of resident killer whales in the shared border waters of Western Washington and southwestern British Columbia has dwindled to 75 individuals. Orcas primarily use sound—including echolocation—to hunt for food, orient and communicate. Ship noise can mask the whale calls, effectively blinding the mammals, whose ears in a lot of ways act as their eyes. 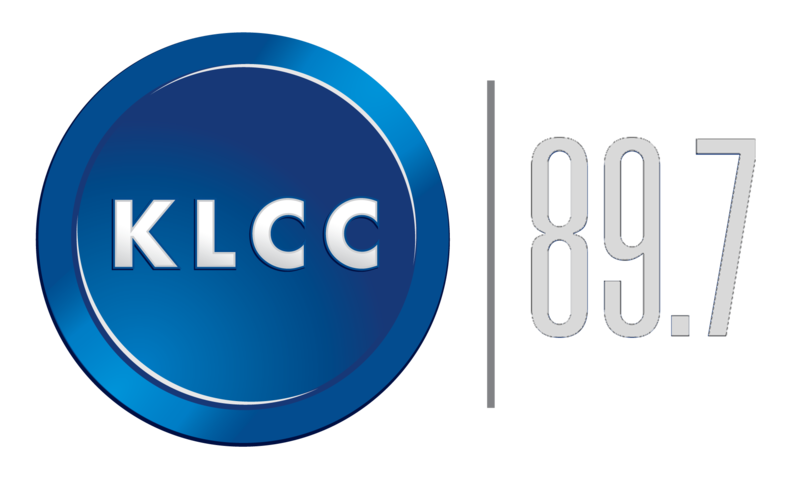 Canadian and American government agencies have identified physical and acoustic disturbance as one of the key threats to survival of the iconic killer whales. The Port of Vancouver, the primary destination for large vessels transiting Haro Strait, is also trying to incentivize quieter ships by discounting harbor fees for ships that meet low-noise criteria.